Knexfan won't stop bugging me about this so I'm posting this as a slideshow (just kidding...). All of this is copied directly from this page. I made another SMG and a Battle Rifle! The SMGs are almost exactly alike, except when I made the second one I noticed some problems and made a few small changes. Also, I didn't have enough of those swingy pieces I used for the forestock joint, so I used ball and joint pieces, which worked great. Here is the description from the page I made when I made the first one. 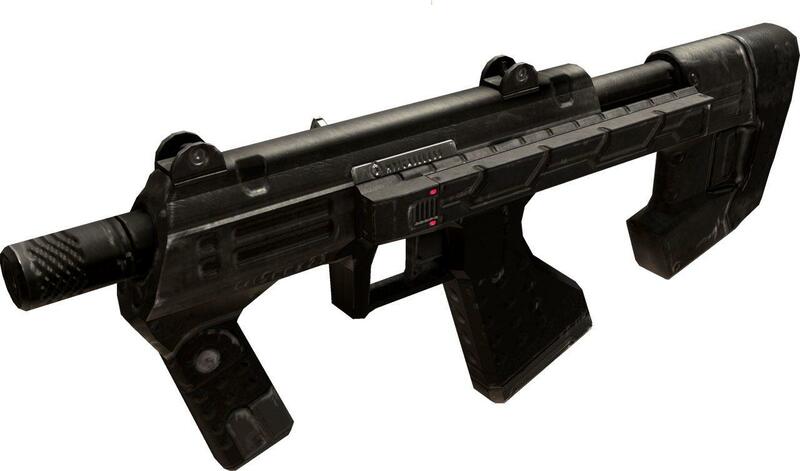 This is a K'NEX model (just a model, not a gun) of the M7 Caseless Submachine Gun from Halo, better known as the SMG. It has twin notch sights, rear and fore stock, and a solid barrel. The stock is extended, the way I made it, but I'm thinking about making it collapsible. It should be fairly easy to put in a firing mechanism, but I don't plan on doing that right now. I don't think I'm gonna post instructions because I would have to take it apart. If anyone can dissect it in their minds, go ahead and make an Instructable, but make it a collaboration with me. I based my model off the BR55HB SR, which is the actual name for the Battle Rifle in Halo 3, so it includes all the changes. It has the elevated rail, which has a scope on it. You might notice at the end of the barrel in the picture of the actual gun, the barrel looks expanded at the end. I did this too. The inside of the model is almost completely hollow, so it would be easy to convert into a gun. The barrel at the end would be hard though. The whole thing is very solid, even though it's hollow. It's also very easy to make, unlike the SMG. do the smgs shoot or not? have you watched the video my smg's on youtube? Nope, you'll have to link me. can i get some more pics of the smg? i might be able to build and post! Yeah, because K'NEX guns don't work, and they were made purely for aesthetic purposes in the first place. You could try making firing ones though. What? 99% of the k'nex guns on this site fire something. In fact, I want to make a SRv.1 to play airsoft with. I've made many airsoft guns, and even made up my own designs, and not one of them fired over about five feet. And I made them to exact specifications. What's a SRv.1? You must be new to k'nex gunning. The SRv.1 is a k'nex gun on this site made by killerk that can shoot accurately up to 75 feet. It is supposed to be able to get a piece to go up to 300 feet. Look it up.